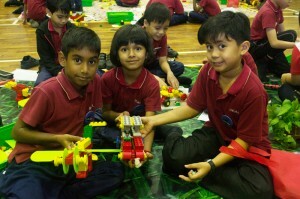 LEGO Robotics has been one of R.E.A.L Schools’ staple and unique extracurricular offerings that aims to generate and grow students’ interest in the field of Science, Technology, Engineering and Mathematics (STEM). Through LEGO, a hands-on approach is integrated into the learning process, inspiring students to have an innovative and imaginative mind. On 2nd August, R.E.A.L Schools National, Shah Alam Campus held its annual LEGO Challenge Day (LCD) with several objectives in mind. Presenting ‘Jurassic World’ as this year’s theme, the event is geared towards stimulating, developing and improving students’ creative and critical thinking, problem solving and decision-making skills. The initiative is also seen to nurture teamwork and leadership capabilities, as well as providing a platform for students to apply knowledge and skills acquired in the classroom into real-life scenarios. 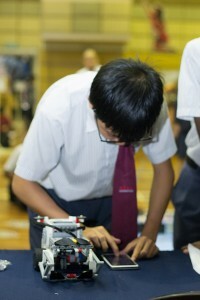 In a series of games and challenges that saw the Junior students pitting their wits, dexterity and technical know-how to build functioning robot models made from LEGO pieces; visitors were both intrigued and impressed by the level of creativity and passion displayed by the participants. For the older and more advanced students, basic knowledge of programming was also required in order to build a model that serves a specific purpose or task. At the end of the day however, the objective was to also have fun while learning. This was certainly helped by the attractive colours and scale of the LEGO creations. In line with the ‘Jurassic World’ theme, enclosures (that were more akin to mini cities) were built in order to contain the dangerous ‘dinosaurs’. Unconventional ideas were encouraged and those who exhibited them stood out from the rest. R.E.A.L Schools’ distinct curriculum offers unique programmes and activities that ensure students gain more than just theoretical knowledge. The school emphasizes on broader learning outcomes for students such as character development as well as collaborative and communication skills. These soft skills are life-long in nature and will prove essential in their future life and careers. In essence, LEGO Robotics is a fun and noteworthy activity that is growing year on year. The innovative programme helps to shape students into balanced, confident and creative individuals. Thus, it is safe to say that unlike dinosaurs, LEGO Robotics is here to stay and far from going extinct. The post LCD Lights Up Shah Alam Campus Community appeared first on best international schools in malaysia.